SANTA CLARA, Calif. — On Thursday, three days before the winningest quarterback in NFL history would play The Last Game (or at least the game we’re sure is the last one), he lined up his offense around the defensive 20-yard line and barked out signals. This would be the last full series of plays in the Super Bowl 50 practice week for Denver at Stanford Stadium, their home for the week … and maybe the last full series of practice plays in Peyton Manning’s life. The sun was nearly touching the top of the west stands of the stadium on this beautiful California winter afternoon, creating an image of a sunset and lengthening shadows on the field as Manning directed traffic. “Be alert! Be alert!” he called out, motioning Emmanuel Sanders across the formation. And Manning shouted out the play, which began with “Z Motion!” And then the snap, and then … nothing. No one open. And the offense did, Sanders trolling the back of the end zone and Manning hitting him for a touchdown. Manning completed 24 of 28 passes against the scout team defense on this temperate afternoon, and his coach, Gary Kubiak, said afterward that this was as good as the 39-year-old Manning had looked all season. Around the Broncos as the week aged, there was growing confidence that Manning could once more have a Manning-of-2013 game. And then the Broncos won the Super Bowl. By 14. And then Manning, in the bowels of Levi’s Stadium on Sunday night, was fine with being along for the ride, almost a 2000 Dilfer, on a team with the best defense in the league, one that absolutely pummeled Cam Newton. 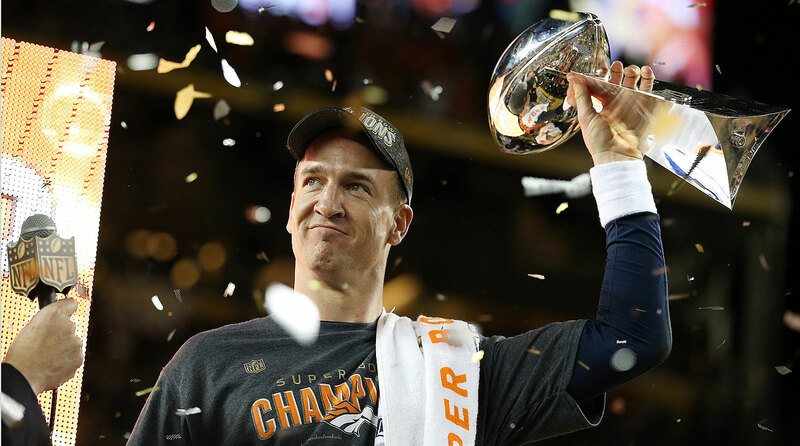 Manning is the first starting quarterback to win a Super Bowl with two different teams. It must be daunting, and it must be a relief, to go from winning like Clayton Kershaw to winning like Mark Buehrle. To be utterly dominant, and then to be along for the ride on a team that hits four home runs every night. The way the Blue Jays battered the ball late last season is the way the Broncos’ defense beat Ben Roethlisberger, Tom Brady and Cam Newton in their great playoff run. Denver has a great defense. Holding Big Ben to 16 points, Brady to 18 and MVP Newton to 10? Holding the Steelers, Patriots and Panthers to four touchdowns in 12 quarters? Carolina, New England and Pittsburgh were 1-3-4 in the league in scoring, yet managed all of seven third-down conversions in three games. Von Miller is the star of this team. He and DeMarcus Ware and two young defensive linemen (Malik Jackson and Derek Wolfe), and a couple of swift linebackers and a strong and physical secondary. Manning can complete 13 of 23 for 141 yards, with two turnovers and a 56.6 rating, and the Broncos can still be the ’85 Bears. • VON MILLER REACHES THE TOP: He hit bottom two years ago, with a suspension and an injury. After a Super Bowl 50 MVP performance, he’s solidified his status as a franchise player. Next up: a massive payday. But in December, when the rehab was slow and the Broncos were struggling on offense, losing to Oakland and Pittsburgh in succession, Kubiak still was convinced the team was good enough to overcome not knowing if or when Manning would play. “There can still be a fairy-tale ending to this season,” he confided to a friend in December. And there was, of course. Manning returned to play the second half of the final game, then as a complementary player in both the Pittsburgh and New England wins, all the while having the free world think he was retiring at the end of the year. Which he likely will do. But after talking to Dungy nine days ago, Manning felt convinced he needed to let this moment live without infecting it with the so-called Disease of Me. On Saturday night, Kubiak asked captains Manning and Ware to speak to the team. Ware took a religious tone. “When you walk into the valley of the shadow of death,” Ware said, “you’re not alone.” And he showed images of the offense, the defense and the special teams on the big screen, to emphasize the team aspect of the coming day. Manning did it differently. He talked about the people in the organization, the unsung people they wouldn’t know, or know well. He quoted a favorite pastime of Kubiak’s, the coach’s preference to use “Wise Words” through the year to pass along a lesson. “One of my favorites,” Manning said, “is, ‘Life is fair. Keep working.’” Quarterback coach Greg Knapp said it was the best team-unifying speech he’s heard from a player in his years in football. “We were ready to play last night,” tight end Owen Daniels said Sunday. Manning said, “Like a baby. Ten-and-a-half hours.” Much longer than usual. Whoa. Maybe the man really was at peace. The game was, in many ways, 1966 football. Quarterbacks playing inefficiently, at least in part because of the ceaseless pressure from both defenses. And it came down to, at the end of the game, Denver trying to play keepaway in a six-point game (Denver, 16-10) the same way the Broncos tried to play keepaway in an eight-point game (Denver, 20-12) in the AFC title game against New England. Third-and-nine, Denver 26, 5:42 left. Surely Manning would try to convert through the air. No sir. “I thought I saw him change the play to a run,” said Dungy. And Manning did. C.J. Anderson, gain of two. Punt. An incompletion would have taken maybe seven seconds off the clock here. The two-yard run took 43 seconds off. Britton Colquitt punted. Manning was playing four-corners. He didn’t care. He had Von Miller to strip-sack Newton for the second time moments later, and Anderson scored the clinching touchdown, and Peyton Manning won a Super Bowl without throwing a touchdown pass. He went 3-0 in the postseason and didn’t throw for a touchdown in two of the three wins. But he has his second Super Bowl title now. And in a day or two, he’ll get away, somewhere no one will find him and his family, and he’ll figure out what to do with his life. At least for now. “I haven’t decided yet,” Manning said—and he has to know a nation eye-rolls at that. Everyone thinks he’s riding off into the sunset the way Bettis and Strahan and, yes, Elway, have done in the past two decades. “Ashley and I, we’ll have that talk at some point, but we are going to enjoy this tonight and celebrate. Our kids are four and they are in Pre-K and the teachers say, you really shouldn’t pull them out of school. We are pulling them out! We are going somewhere and we are going to get the heck out of town. “I have one thing I’ll say, I’ve had good experience with making some decisions, choosing where to go to college, staying for my senior year in college and deciding which NFL team to play for in free agency four years ago. I’ve taken time on all those, I’ve prayed about it, I’ve talked to some people about it and I think I will do that with this. But I have a peace about it whichever way it goes. I’m glad I have been able to get through these two weeks with the focus staying on the team, because that is what it has been about this year. I’ve been a part of it. “Do you know deep down inside what you are going to do?” I said. But if this is it, and assuming it is, this has been the kind of year Manning has never come close to experiencing as one of the best players ever. Yanked from the lineup. Hurt in midseason. A backup when he returned. Coming back to win a Super Bowl. “Somebody could say, this year, you really did everything as a QB,” Manning said, sounding wistful. The bus was waiting on him, and he could feel the world waiting for him. For once, he didn’t seem to care. It did. For 53 Broncos and a coaching staff and an organization. An egalitarian Super Bowl, with the quarterback in twilight a part. And the smile on his face, the wide, wide smile, told the story. He was fine with being one of 53, winning a different way. It felt as good. Terrell Davis didn't make the cut Saturday, but the former Broncos running back will have more shots at being voted into the Hall of Fame. My 25th time as a selector was one of the most interesting meetings I’ve experienced. I left the convention center ballroom Saturday afternoon in San Francisco convinced this year’s vetting process was fair to everyone in the room (though Broncos fans surely will not agree). I’ll explain as I tip-toe around some conclusions I drew from the meeting of 46 Hall of Fame selectors and some explanation of why some things happened the way they did. A point of order on why I say I have to tip-toe in this discussion: Voters are required to keep the details of all discussions about candidates in the room and not disclose who said what about whom. So I’ll tell you as much as I’m allowed. First, understand that just as all politics are local, all Hall of Fame arguments are local. I heard from Joe Jacoby supporters angry that the former Hog didn’t make it, from Terrell Owens backers outraged about him not getting in, from Terrell Davis fans ticked off that he got left out. Part of what makes sports fun to watch and follow are the passions that Hall of Fame debates inspire. But just do this: Take the 15 modern-era finalists this year, and cut out 10. I ask you to do this exercise because that’s what the 46 Hall voters have to do in one long meeting the day before the Super Bowl. A maximum of five of the 15 modern-era finalists can make the Hall in a year. Here’s the 15: Morten Andersen, Steve Atwater, Don Coryell, Terrell Davis, Tony Dungy, Alan Faneca, Brett Favre, Kevin Greene, Marvin Harrison, Joe Jacoby, Edgerrin James, John Lynch, Terrell Owens, Orlando Pace, Kurt Warner. Erase 10. Or 11 or 12. This year, it was basically 14 men for a max of four spots, with Favre being the lock of the group. Point is, you've got to get rid of 10 of those 15 … and this, to me, was not an overly strong year for candidates compared to others. 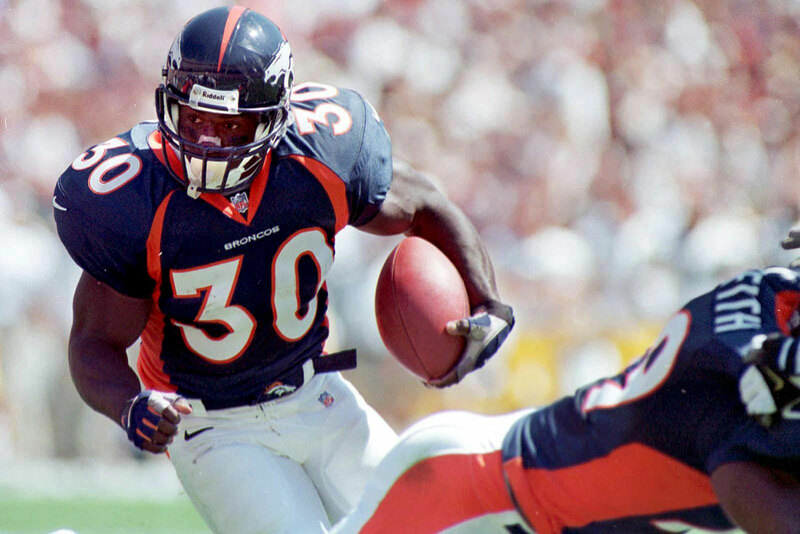 • Terrell Davis is going to make the Hall of Fame. I never thought that before Saturday. But I do now. I don’t know when it will happen, but the events of Saturday convinced me he’ll eventually make Canton. The cases for and against Davis are pretty simple. For: He had three intergalactic seasons, and he was one of the best playoff performers ever—eight post-season games, seven 100-plus-yard rushing games. That is unmatched in football history. Add a fourth year in which he rushed for 1,117 yards, and you’ve got a superb start to a career, one of the best ever. But at 26 he suffered a knee injury that doomed his career, and he was out of football by 29. Now, in the room we’re asked to listen to the cases for the candidates, then cull the 15 candidates down to 10 in a secret ballot; after that, we’re told the 10 top vote-getters, and we have to vote for five in another private ballot. I voted for Davis in the cutdown from 15 to 10. I did not vote for him in the cutdown from 10 to five. But I was sorely tempted to do so. I have always felt longevity has to be a part of a modern player’s greatness. I still do. But I thought very hard (and did so in the weeks leading up to the meeting) whether Davis is the kind of outlier who should sway me. In the end, I just thought there were five better candidates, using all considerations, including greatness and influence on the game and longevity. But after hearing the 24-minute debate, I believe the longevity factor will eventually be overcome—2017? 2018?—and he’ll make it. • The call on the Niners owner. DeBartolo is a tough call. I had leaned against him previously (though not adamantly) because of a salary-cap violation by the Niners and his season suspension for his involvement in a Louisiana bribery incident independent of the 49ers. My belief, after two important interviews last week, is that those incidents should be significant factors in the consideration but not knockout blows, particularly since I believe DeBartolo had no knowledge of the cap violations when they happened. (However, he’s ultimately responsible as owner of the team. I’m just telling you I believe he was working full time on the Louisiana charges at the time and was not the one who committed the violations.) The pros for DeBartolo, essentially, involve the kind of owner he was and how much the Niners won. In the 32 years I’ve covered the NFL, I haven’t seen an owner as beloved by his players, and I haven’t seen an owner that players on other teams wanted to play for more. Aside from the strike year in 1982, DeBartolo oversaw 17 double-digit-win seasons in a row, 16 of them playoff years. After Bill Walsh’s fourth year as coach, a disappointing 3-6 strike year, Walsh told DeBartolo he wanted to quit as coach and become GM, and hire Terry Donahue to coach. DeBartolo told Walsh, “Your value to the franchise is in coaching.” He strongly implied that if Walsh wanted to go upstairs, DeBartolo would part ways with him. So Walsh stayed—and set the stage for three Super Bowls in the next seven years. I think you look at DeBartolo’s complete picture, warts and all, and he more than passes the test for an owner who belongs in Canton. • Why Dungy? In fairness, I have worked with Tony Dungy for several years at NBC, so I see why you’d find me partial to him. I can’t do anything about that, other than to say I do my best to keep my personal feelings for any candidates out of my deliberations. So … many don’t understand why Dungy—22nd on the all-time wins list, with a 9-10 playoff record and one Super Bowl victory—is making the Hall. A few numbers help the argument: He’s the only coach ever to take teams to the playoffs 10 straight years; his 10.7 wins per year is best in NFL history. He and Bill Belichick are the only coaches ever to have a run of six straight seasons of 12 wins or better. His post-season record? Meh. But in my opinion, Dungy has to be credited with doing the most for African-American coaches of anyone who’s ever roamed an NFL sideline. I see it often in my observations at NBC, as he advises risers or fallers in the business by cell phone on Sundays. And you can’t underestimate the impact of Dungy being the first African-American coach to win a Super Bowl. It’s a layered case that Dungy makes, and I think he’s deserving. On Thursday night, I could have sworn I was listening to Will Smith when I met Dr. Bennet Omalu, the neuropathologist who inspired the movie Concussion, after he spoke at the Nourse Theater in downtown San Francisco, a mile from the heart of the Super Bowl activities. “Tell the TRUTH!” Omalu said with intensity, his eyes boring a hole in me. But he emphasized that football should exist. “I am not advocating banning football. I am advocating education … I’m for intelligent football that enhances us, rather than football that steals away who we are,” Omalu said. I’ll be writing some about Roger Goodell’s State of the NFL speech this week, but I wanted to present some of the Omalu remarks today because they are enlightening, and they’ve gotten very little attention in the press. He’s not going away—nor should he. I’m not sure I’d call it outrageous that the NFL is ignoring him and not engaging him in discourse. But people like Bennet Omalu and Ann McKee should be sharing their expertise regularly with football officials. What does the NFL have against hearing from all sides on what is, by far, the most important issue facing the future of the game? 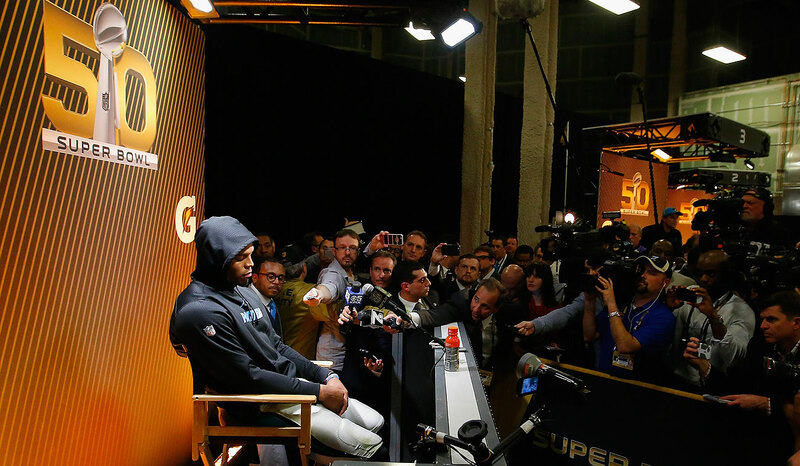 A dejected Cam Newton didn't answer many questions in his post-game press conference, eventually walking away. —Cam Newton, during a terse post-game press conference, asked if he could put his disappointment into words. —Denver linebacker DeMarcus Ware, praising teammate and Super Bowl MVP Von Miller for his huge plays in the first and fourth quarters of the victory. —Panthers linebacker Thomas Davis, in an Instagram post I urge you to check out. Davis played in Super Bowl 50 with his arm in a cast after breaking it in the NFC title game. Davis record seven tackles against the Broncos. —Peyton Manning, at his last pre-Super Bowl media availability on Thursday, responding to a question from reporter Snoop Dogg. —J.J. Watt, accepting his award at NFL Honors on Saturday night. Britton Colquitt, punter, Denver. I have been doing this column for 19 NFL seasons, and I feel quite sure I have never named a punter the Offensive Player of the Week. And here I’m doing it in a Super Bowl. But on a day when the Broncos gained 194 yards—an amazingly low 130 in the final 55 minutes of the game—and converted one of 14 third downs, the only way they had a chance to win was by controlling the ball. That starts with a punter who directionally kept the ball away from the dangerous Ted Ginn Jr. Colquitt was brilliant at it. Ginn had two return yards. Two. For the game, Colquitt punted eight times for an average of 45.9 yards, and a net average of 45.6. Eight of Carolina’s 16 drives started inside the Panther 20; another five between the 20 and 30. A great game on the big stage for a very good punter. Von Miller, outside linebacker, Denver. The Broncos defense is the main reason the franchise now possesses its third Lombardi Trophy, and Miller was the catalyst. Miller made the two biggest plays of the game, stripping Cam Newton twice, one turning into a defensive touchdown and the other essentially ending the Panthers’ night. Miller deserved the MVP and now he deserves to be paid in J.J. Watt’s league: $20 million-plus per season. Kony Ealy, defensive end, Carolina. What a game to have a coming out party. Ealy, a 2014 second-round pick out of Missouri, was the best player for the Panthers and would have had a strong case for MVP had Carolina won. Ealy had three sacks, a forced fumble and a skillful interception of Manning. Carolina’s defense already was full of game-changers and another one emerged in Super Bowl 50. Wade Phillips, defensive coordinator, Denver. The man just might retire this award. What a postseason Phillips had, his defense holding Pittsburgh, New England and Carolina to an average of 12.7 points a game. He once again put together a brilliant game plan. Cam Newton never had the kind of open rush lanes he always seems to find five or six times a game. Phillips blitzed the safeties a little, but mostly relied on his great players on the defensive front to get home—which they did. Seven sacks. Six, of a quarterback who takes such great pride in not taking sacks, and a seventh after nailing Ted Ginn behind the line when he was in option-pass mode. “There’s the man,” said Malik Jackson, pointing admiringly to Phillips after the game. “What a game he coached.” We saw. Jordan Norwood, wide receiver/punt-returner, Denver. Incredible that in 50 Super Bowls, there’s never been a punt return for touchdown. Midway through the second quarter, Norwood play-acted like he was going to call for a fair catch, except he never signaled for one. Instead, he caught it at the Denver 25, ran right, turned upfield, and got dragged down at the Carolina 14-yard line. Norwood’s 61-yard return is a Super Bowl record and it led to a Brandon McManus field goal, and a 13-7 halftime lead for Denver. Brandon McManus, kicker, Denver. Capping a perfect postseason, McManus booted field goals of 34, 33 and 30 yards, while counterpart Graham Gano missed from 44 before hitting from 39. That’s a 9-3 kicker edge for Denver, and in a game with every possession counting in a big way, a 9-3 edge is a winning edge. For the postseason, McManus was 10 for 10 on field goals. Mike Remmers, right tackle, Carolina. 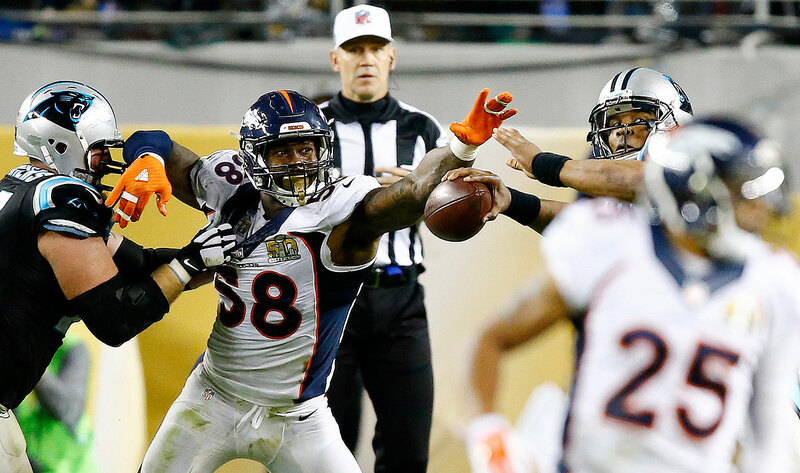 The man who had the unenviable task of blocking Von Miller on Sunday night did not fare well. Remmers was unable to slow Miller on two game-altering plays—the first-quarter strip-sack that resulted in a Broncos touchdown and a fourth-quarter strip-sack that all but ended the Panthers’ hopes. Remmers was not alone in his goat-ness, as the rest of Carolina’s front also was overmatched by Denver’s defense, which finished with seven sacks. Nice piece of symmetry if this is indeed the final game of Peyton Manning’s life. Sunday was his 200th career victory, setting an NFL record. He’d been tied with Brett Favre at 199 wins. Peyton Manning turns 40 six weeks from tomorrow. Longest debate: Eddie DeBartolo, 49 minutes, 27 seconds. Shortest debate: Brett Favre, 8 seconds (8.09 seconds by my stopwatch, actually). Kenny Stabler Stat of the Day: I’ve always considered Roger Staubach an accurate, efficient quarterback. He played alongside Stabler in history. In 1976, with each man in his prime, Stabler, playing in a downfield passing offense, completed 66.7 percent of his throws; Staubach completed 56.4 percent of his passes. That’s not slightly better. That’s hugely better. • On the day of the 1983 NFL Draft, the top pick, John Elway, had his draft party there. • In 1984, Elway was married for the first time and had his wedding reception at the hotel. • When Denver coach Gary Kubiak was hired to be the 49ers quarterback coach in 1994, he lived at the hotel for three months. • The front door of the hotel is 1.1 miles by foot from the entry to Levi’s Stadium, believed to be the closest of any team hotel to venue in Super Bowl history. San Francisco is one of the greatest cities in the world. Of that there is no doubt. But the scene I saw walking the 20 or so minutes from the Nourse Theater through the Tenderloin district back to my hotel in Union Square Thursday night after the Bennet Omalu speaking engagement was frightening. Sad and frightening. I’ve got no problem with panhandlers; I live in New York. And the homeless issue in New York, obviously, is a major one. But I have never seen the number of homeless, block after block, people of many ages, many appearing to be under the influence of something. In a 1.2-mile walk, I’d guess there were 75 to 100 either sleeping on the sidewalk, encamped against a building or seeking help from passersby. This is obviously not my area of knowledge, and the stat that the median rent for a one-bedroom apartment in San Francisco in 2015 hit $3,530 is jaw-dropping. But we’re in a sad place in this country when in one of our great cities we simply accept that scores and scores of people live and sleep on the sidewalks. A no-words retirement announcement for the player who spoke very few of them during his career. Cam Newton was hit 13 times tonight. He hadn't been hit more than 6 times all season. I’m surprised they are airing live shots from the locker room right before the game. That time should be for the players only. Incredible. Friday before the Super Bowl and not one paid print ad in the Sports Section of today's San Francisco Chronicle. Von Miller created two of the four turnovers forced by the Broncos on Sunday. a. Steph Curry, wearing a Panthers number 30 jersey, banging the Carolina drum (a Panther tradition) before the game—Curry right in his own northern California backyard. b. Very classy move by last season’s NFL Man of the Year, Thomas Davis, coming over pre-game to congratulate this year’s NFL Man of the Year, Anquan Boldin, on the field. c. The anthem. Had to go back and watch it on YouTube because it was muffled in the press box, but Gaga nailed it. d. Neil Hornsby. The Pro Football Focus founder wrote for The MMQB prior to the game that the key matchup would be Carolina right tackle Mike Remmers versus Denver pass-rusher Von Miller. “I feel the eventual winner of this [game] is likely to be the same as the winner of Remmers vs. Miller.” Well, Miller went around Remmers on the first touchdown of the game, slamming Cam Newton and forcing the sack-touchdown that Malik Jackson recovered for a touchdown. Good call by Hornsby. e. Darian Stewart, the Denver safety, stripping Mike Tolbert and forcing a turnover. Stewart ($2.25 million in salary and bonuses this year) was a pretty smart signing by John Elway. f. Terrific one-handed pick of Manning by Kony Ealy. g. Prescient call by Jim Nantz on the CBS telecast, saying there had been 227 punts in Super Bowl history without ever having one returned for a touchdown … a few minutes later, Norwood broke a 61-yarder. Not a touchdown, but almost. h. What a catch, Devin Funchess. i. I love sheep singing. Who doesn’t? I looked up at one point in the third quarter, and there was some commercial with sheep singing “Somebody to Love,” by Queen. j. Center Matt Paradis, for his block on Luke Kuechly that freed C.J. Anderson for a nice gain, one of the few times all night (maybe all career) that Kuechly got blocked. k. Kuechly, and Thomas Davis. They are threats on every defensive snap. l. Kawann Short and Star Lotulelei, for being the kind of run-support players that make it so hard for anyone to get momentum in the running game. n. Now there’s a terrific summation of what the Broncos were trying to do, and what they really did do, to Newton. o. C.J. Anderson, with 234 post-season rushing yards. p. Sid Hartman. The great Sid Hartman. The 95-year-old Minnesota sportscasting and sportswriting legend is still doing a Sunday show in the Twin Cities. He’s not traveling much now, but we had a good time Sunday morning talking about the Hall of Fame voting. He was bullish on the elections of Tony Dungy and Eddie DeBartolo. a. Aqib Talib: three penalties, at a cost of 21 yards to Denver, in the first 19 minutes. b. Mike Carey’s pronouncement on the very iffy catch by Jerricho Cotchery that was ruled an incompletion in the first quarter. Carolina challenged the call. Carey said: “Good challenge by Carolina … If I was in the [replay] booth, I’d reverse this to a catch.” Of course, the way Carey’s year has gone, Clete Blakeman ruled the ball incomplete. And watching the replay four or five times, the way I saw it, there’s no way I’d have reversed the call on the field. Just not enough evidence. c. Ron Rivera’s challenge early in the second quarter over seven yards of turf. He chose to challenge a play not ruled a sack by Kony Ealy, and if he was right, the Broncos would have had a second-and-17 instead of second-and-10. Regardless whether he was right or wrong, it was his last challenge of the game. Carolina didn’t have a challenge available for the last 41 minutes of the game. No way I’d have used my last challenge over a seven-yard difference in field position. d. Manning’s first pick—and first turnover—after 145 efficient post-season minutes, not seeing Kony Ealy quickly enough as he tried to muscle a ball to Jordan Norwood. 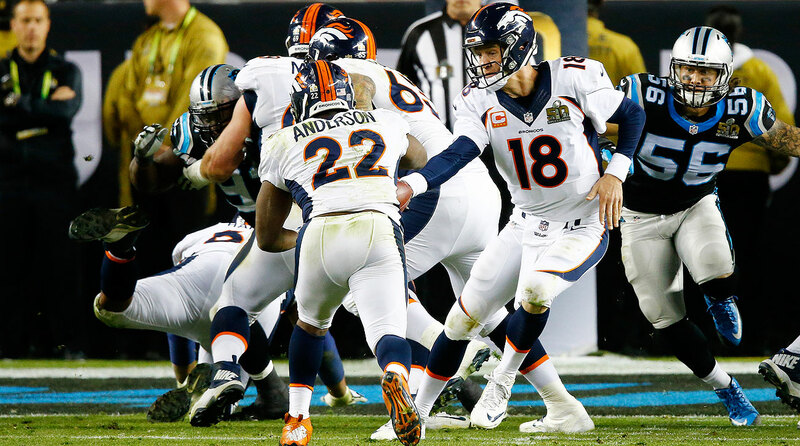 This bad error by Manning erased the Broncos’ chances to build a 16-7 halftime lead—or better. Absolutely cannot make that throw. Manning got lucky on a dropped pick early in the game too. e. Terrible late-first-half clock management by Carolina, wasting 13 seconds in the final minute instead of being crisp and getting to the line and sprinting through a couple of plays to try to get in field-goal range. f. Third-down efficiency, in total: four for 29. That is all-time bad third-down converting. g. Demaryius Thomas. It can be forgotten now, but he was The Invisible Man this postseason. For a jillionaire wideout, these are awful numbers over three games: 7 catches, 60 yards, zero touchdowns. Thursday morning in San Francisco, Goodell addressed a ballroom filled primarily with women, and announced a new rule change to help open more doors for women in top roles with the NFL. The rule only means something when the female candidates being interviewed are serious contenders for the job—something that has been a concern with the Rooney Rule over the past 12 years. So the NFL will start by requiring women to be interviewed for all senior positions within the league office; it’s to be determined on positions below that. “You can see that progress is being made,” Goodell said in his opening remarks for the league's first-ever Women's Summit, held Thursday and Friday mornings of Super Bowl week. “We're going to make that commitment.” The focus of the summit, which included speeches from former Secretary of State Condoleezza Rice and tennis star Serena Williams, was getting and keeping more women involved in sports. One NFL team executive questioned how well the Rooney Rule will work for women when it hasn't been as effective as hoped for minorities, many of whom still too often hear the questions of whether or not they are Rooney Rule-fulfillers when they interview for top jobs. But the idea behind these rules is to get women and minorities in front of team decision-makers and highlight candidates who might otherwise be overlooked. Among the jobs women will now have to be interviewed for include executive VP of football ops, COO and, presumably, commissioner. There is no downside to that. 4. I think one little bit of free-agency buzz I heard here is the Broncos won’t be surprised if Browns coach Hue Jackson does more than just sniff around Brock Osweiler. Cleveland is in an interesting spot, picking second in the first round with a cadre of interesting but not lock college quarterbacks on the board. They’re surely not prepared to know what they’ll do a month from now in free-agency, but if Jackson is shaky on Jared Goff and Paxton Lynch and Carson Wentz, maybe Cleveland will look at a reasonably priced (or so you would think) prospect like Osweiler. Side note: Denver has three important free agents—Osweiler, who will be earmarked to replace Payton Manning; pass rusher Von Miller, who will be franchise-tagged if John Elway can’t sign him before the start of free agency; and defensive end Malik Jackson, who clearly would be one of the top players on the market if not signed by Denver before the start of the signing period in March. Jackson is 26, and the Broncos tried to get him signed late in the season but couldn’t come to terms. Instead, Denver signed fellow defensive end Derek Wolfe, also an ascending player, to a four-year, $36-million deal. I could see an end-needy team like the Giants going hard after Jackson if he’s out there. 5. I think I agree with Neil Best of Newsday: Nashville would be one heck of a Super Bowl city. 6. I think this was the idea of the week at the Super Bowl: Roger Goodell said two personal fouls in a game should lead to a player’s ejection. Not sure it should be that cut-and-dried, but the concept is good. I’d want to think about this, because if a pass rusher gets nailed on the first series of the game with a borderline personal foul for hitting the quarterback late, there’s a good chance he would play the rest of the game feeling like he’s got to lay back instead of playing as normal. But this is an excellent debate for the Competition Committee to have. In a particularly egregious case such as Odell Beckham Jr.’s loss of control and helmet-smash of Josh Norman in the Giants-Panthers game, it would have gotten Beckham thrown out—which would have been justice. • From the Utah home of Carolina’s Star Lotulelei, Emily Kaplan with the great American success story of the Star Lotulelei family. • From across America, Robert Klemko with an oral history of one of the strangest seasons in recent NFL history, the inaugural one of the 1995 Carolina Panthers. • From snowy Colorado, Klemko with one of the heroes of Super Bowl I, Hall of Fame tackle Forrest Gregg, struggling yet enjoying the autumn of his years. • From a little town in Texas, Kaplan with the compelling story of Cam Newton’s junior college roots, which included mooing cows as his daily alarm clock. • From here in California, one story from the site of the game that featured the kind of reporting we’re proud of here: Jenny Vrentas on how Carolina owner Jerry Richardson turned a 1959 Baltimore Colts playoff share of $4,674 into an NFL franchise 34 years later—and into a Super Bowl team today. 8. I think, Johnny Manziel, your words don’t matter any more. Your words at the 2014 combine and pre-draft convinced the Browns you had turned over a new leaf. Your words after 73 days of rehab last summer tried to convince people your life was finally in a good place. Your nothing-happened-here claims after a highway incident with a girlfriend and admitted day drinking last fall raised lots of eyebrows inside the Browns but again got mostly a pass. Your silence after going to Las Vegas while inactive on the last weekend of the regular season pushed you off the Browns. (It’s just a formality now.) And your claims last week that you’re focused on football and after another incident with a woman in Texas in which WFAA-TV reports you said, “Shut up or I’ll kill us both,” … This isn’t about football anymore, and won’t be for a while. This has to be about focusing on a life gone way off the tracks, and trying to get the help you need to get it on the tracks. The fact that your agent, Erik Burkhardt, a good and reputable man, would choose to part ways with you Friday should be the last straw. Get help. “I truly believe if they can’t get him help, he won’t live to see his 24th birthday,” said his father, Paul Manziel, in the Dallas Morning News. Johnny’s 24th birthday: Dec. 6. 9. I think Deion Sanders needed to check the reported facts in the Manziel story before telling Cleveland.com this regarding Manziel: “It’s hard to be a young kid. You have to go through these trials and tribulations to find yourself and that’s what he doing right now. He’s trying to find himself. And I empathize with him. Johnny’s girlfriend. That’s his issue … I’m not saying she is the problem. I’m saying their relationship is inflammatory.” Lord, is that a tone-deaf statement. In the category of Worst Analyst Quote of 2016, that one takes the early lead—and will be hard to beat. a. Top-notch column by Bruce Arthur of the Toronto Star on the Roger Goodell news conference from Friday. Arthur’s really good. b. This piece, excerpted from a book, from a former Yale admissions officer, peeking behind the curtain of the elite college admissions process. c. Mark Leibovich’s outstanding story in the New York Times Magazine about the ability of the NFL to step over and around land mines week after week and remain the most powerful sports league there is. e. Never thought of that, but it’s perfect. g. That’s a quote we should all heed, about the never-ending flood of information that makes it odd for us to just … be. h. Craziest story, so far, of 2016? It’d be hard to beat this one, from the Washington Post. i. Biggest surprise of Super Bowl week, to me? That it was not a travel nightmare. On Wednesday, Thursday and Friday, I had to travel to Stanford (39 miles each way) and was impressed that the place wasn’t the gridlocked city/area that I’ve often seen over the years in San Francisco. Twice I was part of police escorts, which obviously made the rides simple, but mostly I was in cars or Ubers or cabs, and the region moved people around well. j. Thanks, hugely, to Stanford grad student Shane Newell for being my part-time driver/full-time journalism-discusser while covering the Super Bowl. You ask all the right questions, Shane. Good luck. k. And thanks, too, to Gary Pomerantz, the ex-Washington Post football writer who now teaches at Stanford (he has had Richard Sherman and Coby Fleener in class) for giving me the chance to speak with his “Specialized Reporting and Writing: Sports Journalism” class. Some really fine students—inquisitive, principled. Enjoyed our time together. l. Great having dinner and sharing the Bennet Omalu event with you, Cyd Ziegler. My daughter Laura and her wife, Kim, invited the two of us to see Omalu speak. Good conversation and, as I said, an enlightening appearance with the subject of Concussion. m. Man, do they love the Warriors here. Out in an Irish place Saturday evening while the Warriors-Thunder game was on 29 TVs (or so it seemed), the crowd exploded four or five times, and you had to catch yourself to avoid jumping out of your skin. n. Coffeenerdness: I was lucky to be able to stop by Blue Bottle Coffee three times while in the city. That is one perfect cup of coffee. Dark and intense, like an Italian Roast. The smell in that shop was not to be believed. Heavenly. o. Beernerdness: Team The MMQB is indebted to Jim Furman at Black Hammer Brewing on Bryant Street in the SoMa district of San Francisco, not far from the Giants’ ballpark, for our Friday afternoon Tweetup. Jim was so welcoming to us. What a tremendous space. And dog-friendly! There’s a bar dog, Growler, a curly-haired guy with a love for the bar pretzels; the dog will dance on command on his hind legs. I highly recommend the visit if only to meet Growler. My favorite beer of the three I tried: The Nautilus Hibiscus Saison, which had a hint of coriander and citrus (and hibiscus, a first in the King beer repertoire) and was terrific. Thanks, too, to all the supporters of our site who came out and made us feel welcome. p. I finally met PFT Commenter. Interesting guy. Seems to like green wine. I believe his MD 20/20 selection the day I ran into him was Lime-arita. The guy’s a cult figure, from what I could see of the crowd’s reaction to him. I am so honored by his “Monday Morning Bowel Movement” column. You know, MMBM. q. What’d I miss politically in my Super Bowl cocoon? Much? s. This column will not die with the end of the NFL season. Look for it—albeit shorter—continuing next Monday with the annual Super Bowl Hangover edition, as I begin the 20th year of writing this web column. You’ve been a great audience this year. Thanks for reading, reacting and caring.